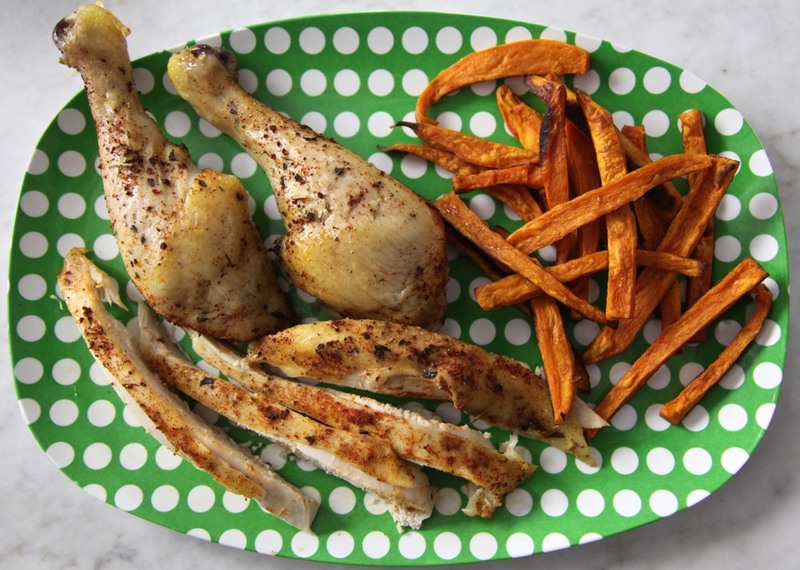 Every mom needs a few recipes in her cooking arsenal that she can fall back on Monday to Friday in order to get dinner on the table pre-meltdown by the troops! 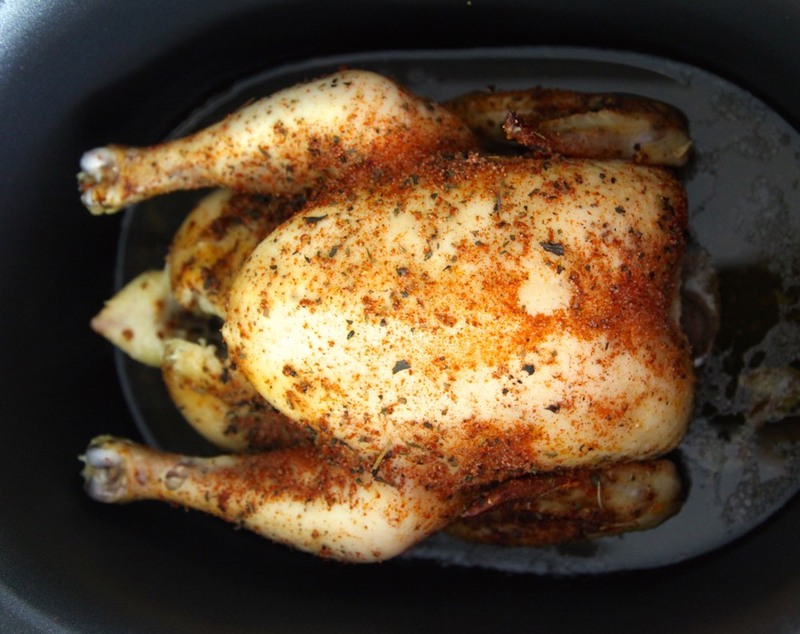 One of my go-to recipes to prepare every week is Chicken in a Crock Pot which I’ve been making for years. I started jazzing it up a bit and made it into this Herbed Chicken in the Crock Pot. As good as the juicy, melt in your mouth chicken tastes on it’s own, the addition of the herbs takes it to the next level. Before I leave for school pick up I pop it into my slow cooker and race out the door, and then come home right before dinner needs to be served to a piping hot meal that just needs a simple side dish like Balsamic Roasted Onions, Asian Succotash or Lemony Quinoa Salad. The best part is that you should have enough leftovers to make recipes the following day like Mac, Chicken and Cheese Bites or Mexican Enchiladas. Putting a whole chicken in a slow cooker is also economical compared to buying chicken breasts or cut into parts and you didn’t even have to turn the gas on for your oven to roast it. That’s a major win win! 1. In a small bowl, combine the poultry seasoning, paprika, garlic powder, and salt. 2. Rub the seasoning mixture all over the chicken. 3. 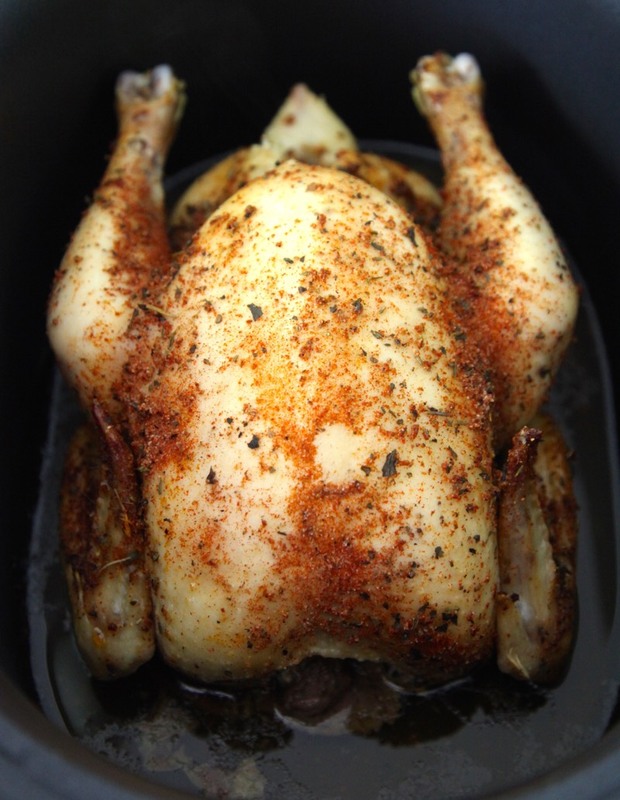 Place the chicken in the crock pot, cover, and cook on high for 2 1/2 - 3 hours, until a meat thermometer reads 160F. 4. Allow the chicken to rest for 10 minutes before slicing. Note: The skin on the chicken won’t be golden because this is more of a steaming method, but the meat will be outrageously moist, tender and juicy. It is a seasoning blend you can find in the grocery with all the spices! I love this recipe. Thanks so much. Have a great weekend! Can you cook this on low instead? I ask because I work full time and am usually out of the house at least 10 hours during the day. Thanks! It should be fine on low for about 6-8 hours! If you set the timer, your crock pot will switch to \"warm\" after the cooking time to keep it at a safe temperature, but not overcook it! I would also like to know about how it would do in a crock pot for 10 hours. I love the crock pot because I work full time but I have trouble finding things that don't end up seeming overcooked since I am out all day. Do you eat the skin or remove it before cooking? If not does the rest of the chicken have the spice flavor since the spices rest on the skin? The skin is definitely the most flavorful part, but the meat gets super juicy and flavorful, too, so you don't have to eat the skin! I put chicken, whole or dark meat pieces, in the crock pot for 8-10 hours on low, and it comes out great. plus, if you save the juices, &amp; add the bones, some carrote, celery &amp; onions &amp; some water, you can put it back on low for another 12-24 hours &amp; get stock from it! let the crock pot cool before adding additional, cold ingredients, though. I've done this before, but on low for 8-10 hours. I love that this is can be done in 3 hours. We ate about half and I'll use the rest for a Chicken Pot Pie later in the week. 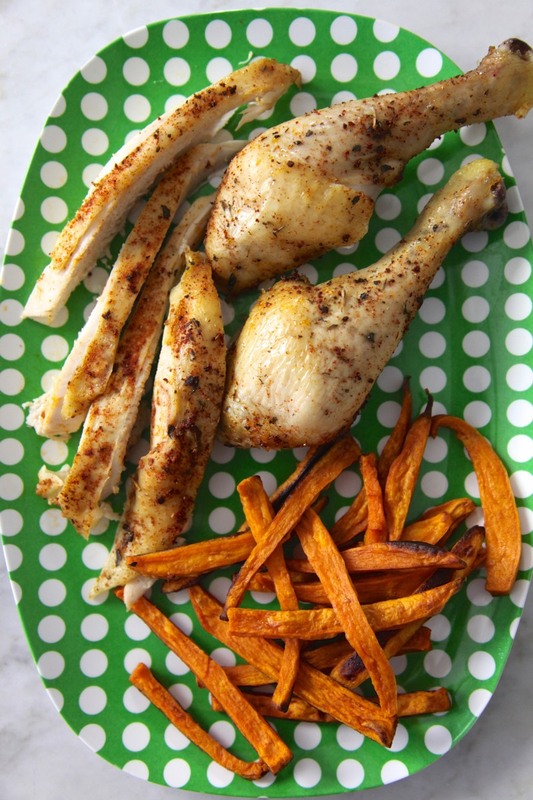 This chicken is awesome I have food allergies so leave out garlic and it works! Thank you! 1. Can I cook it on low for more time?? 2. Have you ever added veggies or organic rice? Yes, cook on low for 4-5 hours, until the chicken is cooked through! I have not added anything to this, but I would love to know if you do and how it works out! i was looking for a simple recipe for some breasts I need to use up. I assume this would work just as well? Also wondered about adding some broth, but not sure if I'd end up with just a boiled chicken breast? Chicken Breasts would work here, too. They'll cook much faster, especially if they are boneless. The chicken will produce liquid on it's own so you don't need to add any to the crock pot. can I cook it on low for an additional 4-5 hours since I have to leave or should I cook it on low for 8 hours? It's ok, I already did this. I cooked it on high for 3 hours and then checked the temp. and it was cooked so I set it on warm for the next 4 1/2 hours and it came out fabulous. I used a lot of herbs and onions and added a 1/2 cup of Marsala wine and it practically melted off the bone. This is becoming my go to! So easy and tasty.